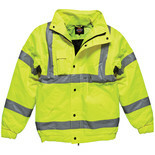 High visibility, Saturn yellow bomber jackets which conform to BS EN471 Class 3 . 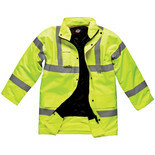 Outer fabric is waterproof with stitched & tape welded seams, inner fabric is nylon quilted with a polyester filling. 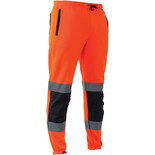 This is a new addition to the high visibility clothing collection for 2017. 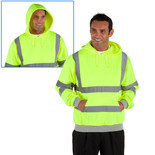 A two tone funnel neck, 1/4 zip sweatshirt, with reflective tape across the shoulders, chest, body & arms. 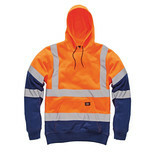 Dickies Hi-Vis Hooded Sweatshirt offers maximum protection by turning the hoodie into a new safety garment style. 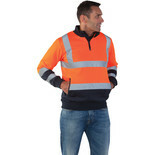 This Dickies Hoodie has been constructed with an adjustable hood, knitted cuffs and hem for a comfortable fit, complete with kangaroo style pocket.